Home » CHENEY, BENJAMIN P.
BENJAMIN P. CHENEY (1815 - 1895). Notable as one of the pioneers in the express business in New England, In 1880, with his associates, he merged his business The United States & Canada Express Co into that of The American Express Co., taking stock in payment. He was promptly made a director of The American Express Co., and remained such the rest of his life, being the largest individual stockholder in the company. He was also one of the pioneers in development of The Northern Pacific Railroad, and a director of the company. It is said that he had the faculty of grasping the possibilities of any railroad enterprise quicker that the majority of men. Unassuming in manner, genial, a thorough business man, clear and accurate in his observations, equally kind to an express messenger as to a railroad president, he was loved by employees as well as officers and universally respected wherever known. 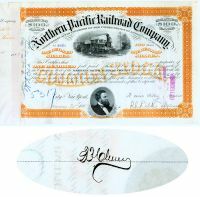 Bradshaw Mountain Railroad Company Issued To And Signed By B.P. Cheney Jr.
1902, Arizona. Stock certificate for one share issued to and signed on verso and attached statement by BENJAMIN PIERCE CHENEY JR. Son of the noted expressman Benjamin Pierce Cheney. Black / White. Green underprint and company seal. Punch and stamp cancelled. The Bradshaw Mountain Railroad was built to serve the mines of Arizona’s Bradshaw Mountains. These mines proved unproductive through, and the line served only as a paper railroad subsidiary of the Santa Fe, Prescott and Phoenix Railway. 1889, New York. Stock certificate for 100 shares. Orange/Black. Engraved vignette of a steam locomotive at top center, nice portrait vignette of Frederick Billings at bottom. Issued to and signed on verso by B. P. Cheney.